Episode 12: "Death at High Tide"
Karl Bretner, a prisoner at a war criminals camp in Germany, is aided in his escape. In London, Chan, with son, Barry, meet with Mr. Wells, the head of a large insurance brokerage firm. The news of Bretner's escape may prove to be of use to his company which, during the war, had insured a ship that was carrying ten million dollars worth of gold bullion which was sunk by Bretner. As Bretner would be the only one who would know the location of the sunken ship, Wells asks Chan to find Bretner so that the missing gold can be recovered. To this end, working on a hunch, Wells sends Chan to the small coastal French town of Arcachon near Bordeaux to meet a man named Henri Marzac. In France, Chan and Barry meet with Marzac at his seaside inn. Henri recounts how he has unsuccessfully tried to help Wells locate the sunken vessel. An experienced diver, Marzac, who is very familiar with the region where the ship was reportedly sunk states that if he could not find the ship, how could an escaped Nazi? Even though Bretner destroyed his log which contained the location of the ship, Chan suggests that Bretner's memory may contain the secret of its location. John Robey, the only survivor of the sunken vessel was pulled from the sea and nursed back to health by Henri and his wife, Marie. Marzac notes that even with Robey’s help, the ship will not be found. Chan and Barry stay at the inn to await the arrival of Bretner. Henri warns that Marie, who hates all Nazis because they killed her parents during the war, may not be able to contain her hatred toward Bretner to the point of doing him harm. Late that night, Chan is awakened by the sounds of Bretner's arrival downstairs. Bretner is accompanied by John Robey who believes that between the two of them there will be enough information to find the sunken ship and the gold within. Henri is offered a cut of the expected profits, but Marie vehemently refuses, her hatred for Bretner being very obvious. When Chan and Barry arrive downstairs, John introduces Bretner as his chauffeur, in order to keep the detective in the dark. Not fooled by the deception, Chan turns in for the night while Barry goes to the kitchen for a midnight snack. Suddenly, Barry is attacked from behind by an unknown assailant. The next morning, Barry recovers from the blow to his head while Henri admits to Chan that the many they saw last night was Bretner, although he does not know where he is now. Henri tells how Bretner has stolen the boat, leaving John behind, and that John is now searching for him. Henri fears that if John finds Bretner bloodshed could result. Soon, a man named Jacob Brun enters the inn. He was a guard at the prison where Bretner was held and is seeking Bretner who, after receiving many favors from Brun, had blackmailed him into helping him escape. Together he, Chan, Barry, and Henri set out to search for Bretner. 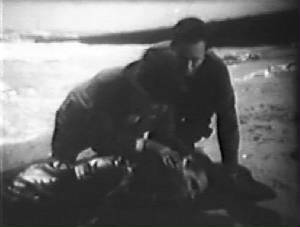 On the beach, Chan finds the body of Bretner with a gold bar still clutched in his lifeless hand. At the inn, Darnet, an police inspector, states his belief that it was Robey who killed Bretner, taking all of the gold for himself, noting that he has ordered a land and sea search for the American. After Darnet leaves, Barry suggests that Brun would have had a motive to kill Bretner. Bretner admits that he would have killed Bretner had he found him first, as Bretner had killed Brun's father at Dachau during the war. Chan feels that the murder of Bretman pointed too obviously toward Robey. Barry adds that the gold bar found with Bretner had obviously been out of sea water for a long time due to its particular discoloration. A proud father concurs. Late that night, Chan catches Brun in the wine cellar of the inn looking for the missing gold. Sending Brun away, he finds Robey bound and gagged. Upstairs, Henri finds Chan who informs the innkeeper that Bretner died in the inn of a broken neck. Also, Bretner's clothing was soaked not by salt water but from the night before his body was found. Pressing Marie, she admits that Bretner died from an accidental fall down the cellar stairs, but Chan suggests that she had helped him fall to his death. Also, Chan accuses Henri of planning to kill his friend Robey. This is verified by the American who appears from the cellar, subduing Henri who had just struggled with Chan. Later, Chan takes Barry down to the wine cellar where he shows his son how the missing gold was hidden inside the wine barrels. Uninvited guest should always remain unobtrusive. Dullness part of policemen's life. Hungry man never quarrels with cook. It is said, "He who has patience to wait will catch small fish if not large." A time to fish and a time to dry nets. Have acquired many eccentricities over passing years; one in particular - I never answer questions at point of gun.